Facebook has now partnered with Dropbox and rolled out a new feature in Facebook Messenger which allows to share files on Facebook Messenger through Dropbox.So, Messenger app now allows you free file sharing from Dropbox. 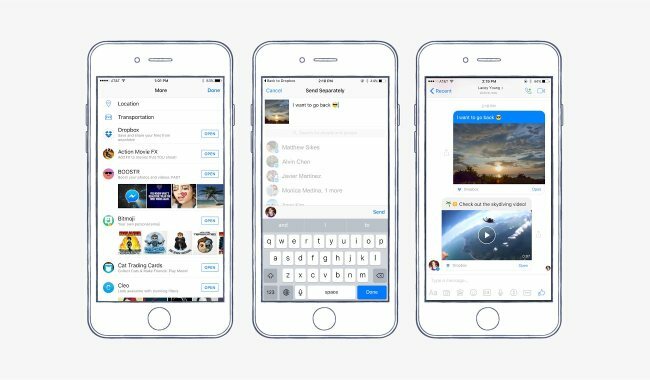 This new feature would allows you to share video files, documents, photos and other files directly with people you’re chatting with on Facebook Messenger app. You do not need any Files sharing websites but you can share files online using your free file sharing Messenger app. This new feature in Messenger is available for both iOS and Android users on Facebook mobile app. To share document mobile users can now tap the More button (three dots in a rectangle) in Fb Messenger app to find Dropbox as an available source. Well, while scrolling through the list of GIF makers you will have to look for Dropbox and need to install it first if you have not used it before. Once, the Dropbox is installed after selecting it from Messenger list, click “Open” and find the document, photo, video, or other file you want to share and tap to send without leaving Fb Messenger. We love to share share vacation snapshots, home movies, or any videos that worth sharing with our Facebook friends. Let us know in your comments on what you think about share files on Facebook Messenger feature, which will be available after Messenger update and will you install Facebook now in your mobile? technology. Trust me, you will be glad that you paid a visit there.